In the pre-technology era, readers flipped through books with the obvious limitations set forth by print media. While the printed content was at times engaging, it was only possible to use imagination to transcend beyond the words printed on the page. But the advancements of the modern world are changing this. Today, publishers are pushing the boundaries of print by leveraging smartphone technology to enhance the reading experience. With the print industry struggling to maintain relevancy in a world gravitating towards digital content, there is no better time for books to evolve. The evolution comes at a time when 80% of all internet users now own a smartphone and 87% of millennials say their smartphone never leaves their side. Today some of the world’s top publishers are using QR Codes to bridge the gap between print and digital. Atria Books, a Simon & Schuster group, has had incredible success using QR Code technology to engage readers. 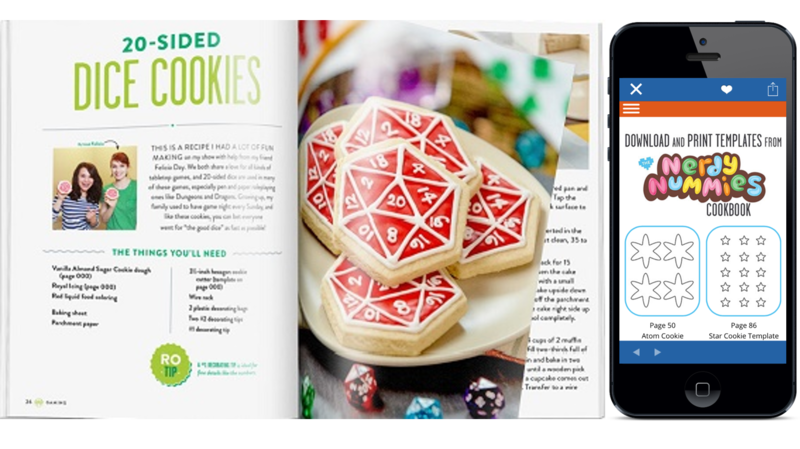 QR Codes printed in The Nerdy Nummies Cookbook by Rosanna Pansino have received almost 40,000 engagements from more than 90 different countries around the world. Mobile triggers have also been utilized in other Atria Books titles written by celebrity cook Rachel Ray and golf pro Nick Faldo, bringing forth similar results. Through the simple introduction of a QR Code, publishers can open up an engagement channel that extends the reach of printed content. QR Codes give readers the option to interact with books like never before. A quick scan can deliver digital content like videos, pictures, audio clips, and mobile games that were previously unavailable through print. It’s important to keep in mind that content is king, so delivering content that adds value to the reading experience is key. • Travel Books– Create QR Codes that link to photo galleries and videos of the destinations mentioned in your book. This might even inspire someone to actually book a vacation through their mobile devices. • Educational Books– Create QR Codes that link to test prep resources or quiz questions hosted on a microsite to test the knowledge of readers. • Linguistic Books– Create QR Codes that link to audio files or videos with commonly mispronounced words, conversational phrases, and translated content. The great thing about QR Codes generated on platforms like ScanLife, is the ability to dynamically alter the content in the code. This allows publishers to keep the content behind the QR Codes fresh without having to incur additional printing costs. Adapting content easily shields the book from irrelevancy that might be accrued with time, while also extending the shelf life. In addition, publishers can easily track the performance of the codes by accessing the platform’s detailed analytics. QR Codes change the way readers can interact with books. They open up an engagement channel with smartphones that is important for publishers to tap into. As smartphone adoption continues to skyrocket and digital content consumption escalates, savvy publishers have realized it’s time to power digital engagements with their readers. Scanbuy invites you to reach us at info@scanbuy.com to get started producing QR Codes and engaging digital content for your reader base.